As seen HERE, I had the opportunity to be a guest on "Tonight Live with Paisley Beebe"
I created a tune live on the show. Well here it is! BRAD REASON - "Paisley - Live"
Indoor Outdoor Virtual Rave 2 warehouse style rooms and one open air chill out area. This festival ROCKED! 2 rooms and 1 chill area going for 3 days straight over 40 DJ's. This event brought the feeling of being at real life event. Some of the TOP DJ's that dropped in for the event were. Needless to say this event will go down in SL electronic music history... big ups to the promoters Keyboard Broek or Aurora Fairey for doing a great job with keeping a constant flow of ppl at the event. Every time I logged into the event there were always ppl 24/7. Tonight Live is a weekly half hour chat show every Sunday 6pm – 6.30 filmed live here in SL in front of a live studio audience. It is a P.G show, streamed live to screens here in SL, then uploaded to the web and videocasted for later viewing. All previous episodes will be available on our website and Google Video.Subscribing to Tonight Live with Paisley Beebe is now available on iTunes! Your avatar may be filmed during the taping of the show. The Video of tonights show will be streamed live at http://www.slcn.tv/ and then uploaded for later viewing a few hours after the finish of the show. As his name suggests, Voicedude does voice-overs for corporate videos and commercials as well as create and sell fun and wacky gestures. He also provides the voice for Detective Jared Washington in the CSI:NY inworld games. Doubledown, our musician of the evening, is a Rl turntable DJ and one of the first to enter SL. He has really embraced this world to allow himself to work full time in SL doing a variety of projects in the music, audio, events, and promotion fields. March 6th 2008 - Masters of Digital Media student showcase (mixed reality event, in first life and second life) - Great Northern Way Campus Centre for Digital Media, Vancouver BC Canada. The First Annual MDM Student Showcase was a huge success. Students of the Masters of Digital Media Program put on an unforgettable show in front of more than 300 industry reps, prospective students, family, friends and supporters. A mixed/blended reality event, the Showcase took place simultaneously in first life at the Centre for Digital Media in Vancouver and was simulcast at the Virtual Centre for Digital Media in Second Life. Avatars from across the globe interacted by means of live streaming to (and from) the school's island ' University Project'. All guests were treated to a live turntable mix show from Second Life DJ Doubledown who was spinning sophisticated beats and eclectic tunes inside the student-created, immersive social space "GrooveTube”. Digi-Runner - the first piece ever created at the Centre for Digital Media. Digi-Runner represents the playful crossover from the virtual to the real that started it all. Groove Tube - an innovative and interactive 3D social space. Groove Tube responds to user selected musical loops and includes immersive visualizations and effects allowing users to collaboratively jam together. Intersection - the second project assigned in the Visual Story course where students took several hundred still photos to create an interactive story containing four separate but intersecting story lines. Sky Palace - brings to life the ancient Chinese legend of the Monkey King. This 3D virtual environment, depicts traditional Chinese architecture, characters, and art forms - running in a web browser and being rendered in real time. Tarot - a mystical, digital circumbulation. Crossing –this film, shortlisted for a Webby Award, is based on the story from Greek mythology of Charon ferrying the dead to the afterlife across the river Styx. 3D Data Visualization– a collaboration between MDM students and the Fisheries Centre of the University of British Columbia, this project creates dynamic, real time visualizations of marine ecosystems based on an integration with the Ecopath ecosystem modeling approach. Bringing data to life in this way may well see the demise of the spreadsheet. "Playing Concerts in Second Life"
Picture this: you're at a gig, tuning up your guitar, when suddenly an 8-foot-tall, pointy-eared gothic elf flies into the room. He is greeted by a purple-skinned, scantily clad woman, who then teleports herself into a seat near the stage. No, you're not hallucinating. 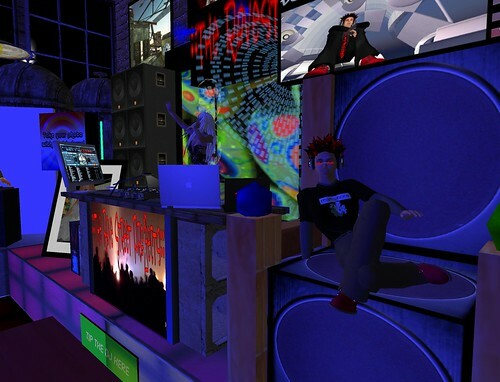 You've entered the online world of Second Life (http://www.secondlife.com/), which is quickly becoming a popular new place for musicians to perform live in front of appreciative audiences.